In 1973 the Adoptive and Foster Parent Association of Georgia was founded. AFPAG works in cooperation with public and private welfare agencies to improve foster care and adoption processes, support foster/adoptive families and provide educational training related to family needs within the foster care system. The association advocate for Foster and Adoptive Parents at the local county and state DFCS levels, as well as with the Georgia General Assembly regarding child-welfare issues that impact our families. 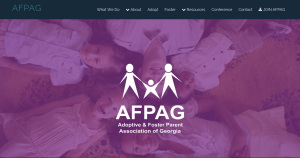 AFPAG is Georgia’s largest advocate for foster and adoptive homes. Click on http://www.afpag.net/ for more information about the association and training opportunities. AFPAG supports and encourages the start-up and continued growth of smaller chapters on a county or regional level. This gives foster and adoptive parents direct support. Individuals and families can contact the State AFPAG association or their local county DFCS office to get more information on meeting times and location within the county or region.